Julian Stedman is the Lay Chair of the PCC, a position he has held since 2014. He has attended St. Edmund’s Church since 2003, having previously been a member of Baptist Churches in Lisvane (Cardiff) and Monmouth. He is committed to helping the church to develop a strong team structure and spirit to help ensure that the ministry and mission of the church are complemented with effective management of the fabric and finances. 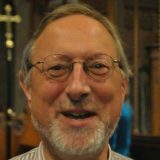 Julian is also a licensed worship leader in the Ministry Area, and is currently undertaking theological training with the St Padarn’s Institute in Cardiff.